This touching narrative uses the poignant makeover of Gracie, a sickly Cavalier King Charles Spaniel, to tell the story of America's hidden puppy mills-commercial kennels that breed dogs in horrific living conditions and churn out often-diseased and emotionally damaged puppies for sale. 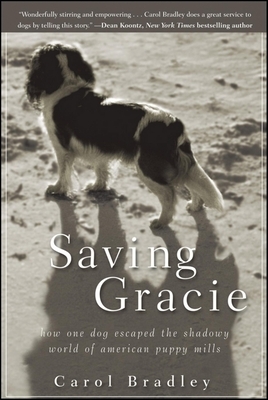 Saving Gracie chronicles how one little dog is transformed from a bedraggled animal worn out from bearing puppies into a loving, healthy member of her new family; and how her owner, Linda Jackson, is changed from a person who barely tolerated dogs to a woman passionately determined not only to save Gracie's life, but also to get the word out about the millions of American puppy mill dogs who need our help. Carol Bradley is a former newspaper reporter who studied Animal Law as a 2004 Nieman Fellow at Harvard. She spent twenty-six years covering the U.S. Congress and state legislatures in Tennessee and New York and writing features and investigative stories in Montana. This is her first book.